Many visitors to Paris are familiar with the Coulee Verte Rene-Dumont, more commonly called the Promenade Plantee, a 4.7-kilometer long elevated park built atop a disused elevated railway line that runs roughly from the Place de la Bastille to the Bois de Vincennes on the eastern outskirts of the city. 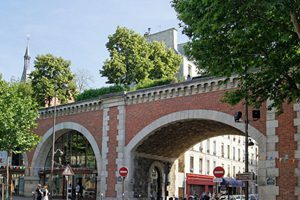 But equally recognizable—and even sometimes confused for the park above it—is the Viaduc des Arts, a rehabilitated arched bridge in the 12th Arrondissement that hoists only a small portion of the park, but is home to many ground-level shops, galleries and restaurants. Viaduc des Arts with a view of the Promenade Plantee elevated park above. 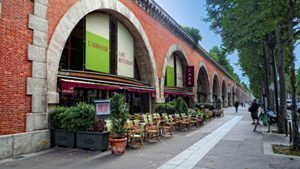 Beginning at 1 Avenue Daumesnil, just southeast of the Opera Bastille, the Viaduc des Arts runs about a dozen blocks to 129 Avenue Daumesnil at the corner of the Rue de Rambouillet. 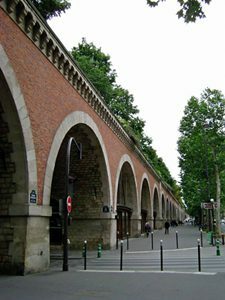 Originally built as the Viaduc des Bastille in the mid-1800s, the 1.5 km viaduct consists of 64 arched vaults that at one time supported a portion of the Paris-Bastille-Vincennes train line that ran above the street. But the train ceased operating in 1969, leaving the ground-level viaduct and the elevated platform abandoned. More than a decade passed before the city opted to build a new, modern opera house near the Place de la Bastille, which necessitated a decision on what to do with the defunct rail line. 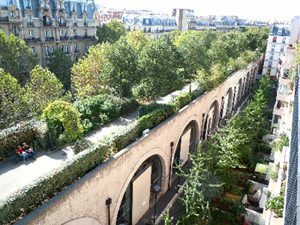 While many championed simply demolishing the elevated train line to make way for new buildings along its entire route, the city’s Atelier Parisien d’Urbanisme (Urban Planning Workshop) instead opted to convert the railroad into an elevated park and to renovate the 64 vaults into spaces for small businesses. Work on the above-ground park began in 1983. Renovations of the viaduct were launched in 1988 under direction of the city’s Societe d’Economie Mixte d’Amenagement de l’Est des Paris (Society of Mixed Economy Planning for Eastern Paris). The first shops were opened in 1994, with the final renovated vaults reaching completion in 1997. And the shops—while typically pricey—are unique and well worth a visit, followed by a spot of lunch at either of the two eateries located in the renovated bridge. And Zephyr (personalization and engraving) at 127 Avenue Daumesnil, among others. Shop hours vary, but tend to be open from 10 a.m. to 6 p.m. weekdays and Saturdays. This entry was posted in French history, Right Bank, Shopping, Sight-seeing and tagged Aisthesis, Atelier C, Atelier de Lutherie Dupont des Arts, Atelier des Arts Culinaires, Atelier Le Tallec, Atelier Michael Fey, Ateliers du Temps Passe, Aurelie Cherell, Avenue Daumesnil, Bicloune, Boutique Malhia Kent, Cecile Jeanne, Coulee Verte Rene-Dumont, Creations Cherif, Fenetres Lorenove, Guique et Locca, HapsatouSy Showroom, Herve-Ebeniste, Ithemba Design Ethik, L'Arrosoir, Le Bonheur des Dames, Marischael-Oftevre, Mason Fey, Parasolerie Heurtault, Paris-Bastille-Vincennes train line, Philippe Ferrandis Bijoux, Promenade Plantee, Rinck, Roger Lanne Artisan Luthier, Serie Rare, Tzuri gueta, Viaduc Cafe, Viaduc des Arts, Viaduc des Bastille, Yann Porret Maitre Luthier, Zephyr by Bob Adams. Bookmark the permalink.